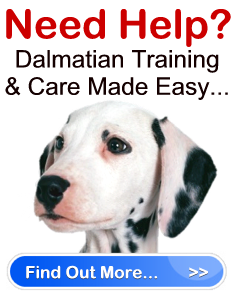 How To Interview Dalmatian Breeders " "
First – Ask to see the sire and dam of the litter – It is important that you see the parents of the litter of puppies you are considering buying from. The sire and dam will give you a good indication of what their puppies will look like as adults and will also clue you in on the temperament that has been passed on. Moreover, when you meet the dog you will get an overall impression of the dog’s happiness. Don’t be surprised if the breeder only has the dam on site. It is not uncommon for a reputable breeder to use a sire that belongs to someone else. Seeing either of the dogs is fine. Inbreeding – Is there inbreeding in the line, if so why? The pedigree – were their any champions among the line? Show dogs – Are the dogs that are bred show dogs? If not, why not? Reputable Dalmatian breeders usually don’t show prospect buyers the puppies on their first visit. This is to prevent people from growing attached to the dogs to early, and from exposing small puppies to illnesses. If a breeder is not willing to show you either dog, take your business elsewhere. This is a good indication that this breeder is only in the business for the money and cares little for the dogs. It is also an indication that the premise where they keep the puppies is not clean or extremely small. Second – Find out about the living conditions of the dogs – Ask the Dalmatian breeders where they keep their puppies and dogs. Are the dogs allowed into their house? If not, how much time does the breeder spend with the dogs in the kennel? How do they socialize the puppies? Do they socialize them with children as well as adults? Are the dogs familiar with household noises (IE. vacuum, etc.) Ask to see the environment where the dog is kept. A reputable breeder will not have a problem showing you their breeding facilities. If a breeder refuses to show you, leave and don’t look back. If it appears that the litter of puppies is kept separate from the breeder and their family, this is a good sign that the pups have not been properly socialized or provided with the care they need. Third – Ask if there are any hereditary illnesses in the line – Ask Dalmatian breeders if there are any hereditary illnesses that affect the breed which you should watch for. Ask what the breeder has done to decrease the chances of this hereditary defect from occurring in the litters he/she breeds. A reputable breeder will test their dog for genetic disorders that run in the breed. Therefore, if they are a Dalmatian breeder, they should be testing their pups for deafness. Other health tests they should do include checking for hip dysplasia with OFA (Orthopedic Foundation for Animals), and eye problems with CERF (Canine Eye Registry Foundation). Find out if Dalmatian breeders have provided puppies with the standard inoculations. Eight week old puppies should have had their first set of shots from the Vet. Ask to see the records of these shots as proof. Fourth – Ask about the contract and if they offer a guarantee – Reputable Dalmatian breeders will draw up a contract which you will need to sign. The purpose of the contract is to protect you, the breeder and the puppy. Always read contracts before signing them! Aside from the contract, legitimate breeders will provide you with a written guarantee. The guarantee is that the puppy is of good health and that should he become seriously ill within a year of the purchase, or can not be registered, the breeder will refund or reimburse the owner. Note: Guarantees are different depending on the breeder, but all reputable Dalmatian breeders will have a return policy. Fifth – Ask for references – Even if you think Dalmatian breeders are reputable, don’t just take their word for it – Ask for references. The best references are the Vet they use and previous buyers. Once you obtain these references, follow up on them. Take the time to contact the references that have been given to you, and ask these references about their experience with the breeder. If a breeder does not want to give you references, or has none, don’t give this breeder a second thought – go elsewhere. Sixth – Ask if they will help you select a puppy that will be most suitable to your lifestyle – All ethical Dalmatian breeders want their dogs to find a good loving home. Therefore, they will want to ensure that the breed is suitable to your lifestyle. A breeder should ask you plenty of questions about your living arrangements, your family (IE do you have any other pets or children), and your experience with dogs and Dalmatians in particular. You shouldn’t feel that the breeder is prying into your personal life or doesn’t want to sell you one of their puppies. The breeder is doing you a favor by letting you know what to expect, and is only looking out for the wellbeing of their puppy. Interviewing Dalmatian breeders is a must when buying a dog.